SwimCity offers 3D-printed floating housing for students in Stockholm Archi-new - Free Dwg file Blocks Cad autocad architecture. Archi-new 3D Dwg - Free Dwg file Blocks Cad autocad architecture. Some Swedish students could find themselves living, and studying, in 3D-printed residence halls floating on the water. 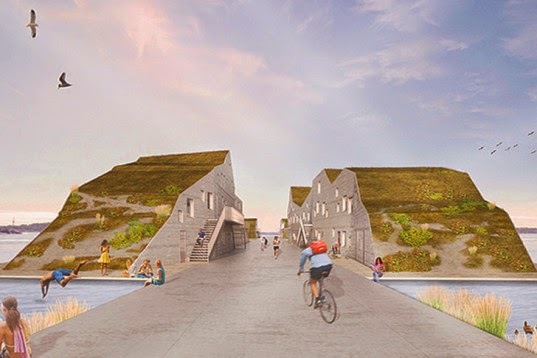 Belatchew Labs is stepping up the dormitory game with SwimCity, a project that aims to increase the supply of housing for young people by creating sustainable living on wateBelatchew Labs is an experimental studio under the umbrella of Belatchew Arkitekter, based in Stockholm. The Labs take on projects where it is necessary to solve urban problems with creative thinking, innovative technologies, and new materials. For SwimCity, the designers sought to keep the carbon footprint of the construction as small as possible, while addressing the problem of overcrowding by positioning the residential structure over the water. Rooftops of SwimCity are covered in greenery, which aids in the energy efficiency of the building in addition to adding to its eye appeal. Individual buildings are connected via a dock-like structure and positioned in almost a web, giving the overall complex a unique shape and allowing nearly every occupancy to have a stellar view of the waterfront. That said, the surrounding waters are seen as “extra space to build on,” according to a press release about the design, and the building can be scaled up or down depending on the need for the particular venue in question. Since SwimCity is intended largely for use as student housing, it’s designed with a youthful, active lifestyle in mind. As illustrated in renderings, the designers envision SwimCity to be traversed by swimmers, cyclists, and strollers-about on their way to and from classes. The green rooftops come in handy here as well, providing additional study and/or lounge space, depending on a student’s needs.